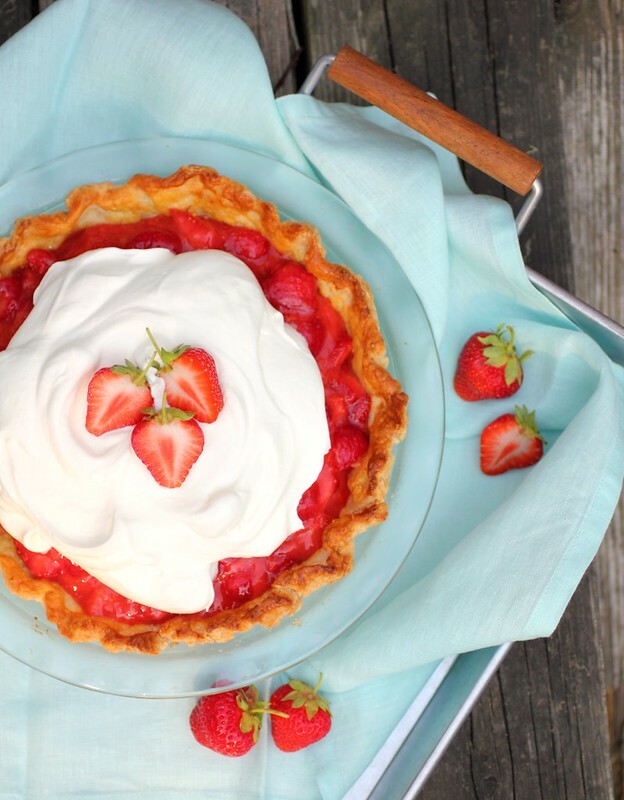 Let's start with Ina Garten's Perfect Pie Pastry (it really is perfect!) 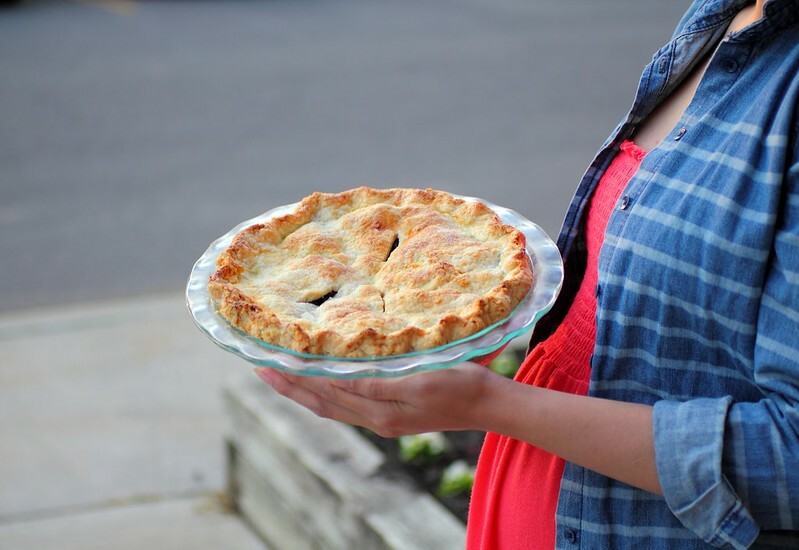 we're using it today in ALL the pie recipes below because it's just that good! ... into the flour mixture below. Use a food processor, a hand-held pastry blender, or two knives. Whatever you use, don't overmix. 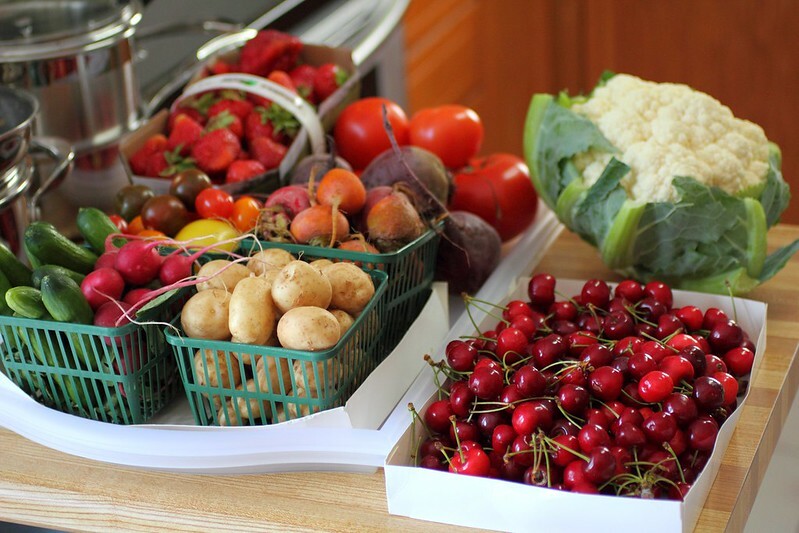 You should still see clumps of fat about the size of a large green pea when you're done. Gather the dough into a ball. Flatten the ball into a disc (at this point you can divide into two and wrap separately) wrap it in plastic wrap, and refrigerate. Instructions: Roll out the pastry and line the pie pan/plate. 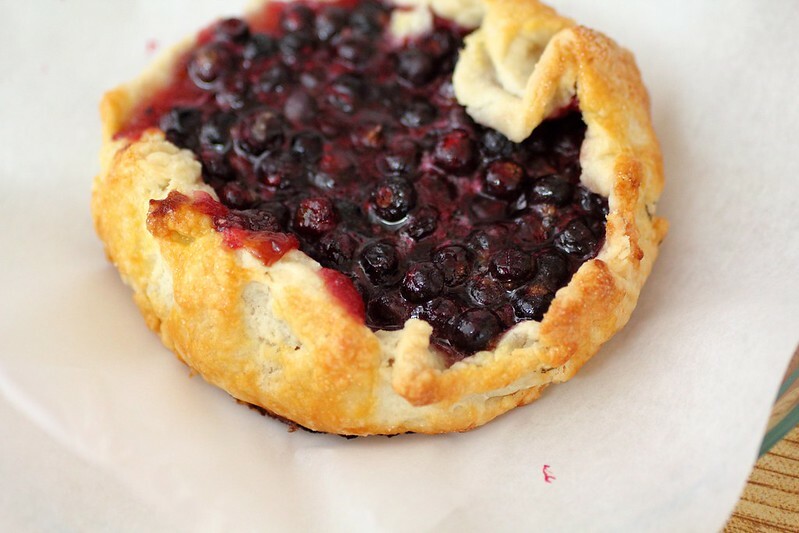 Mix up the filling by tossing the ingredients together in a bowl and fill the pie, try to work quickly as you want to handle pastry outside of the fridge as little as possible and as quickly as possible. 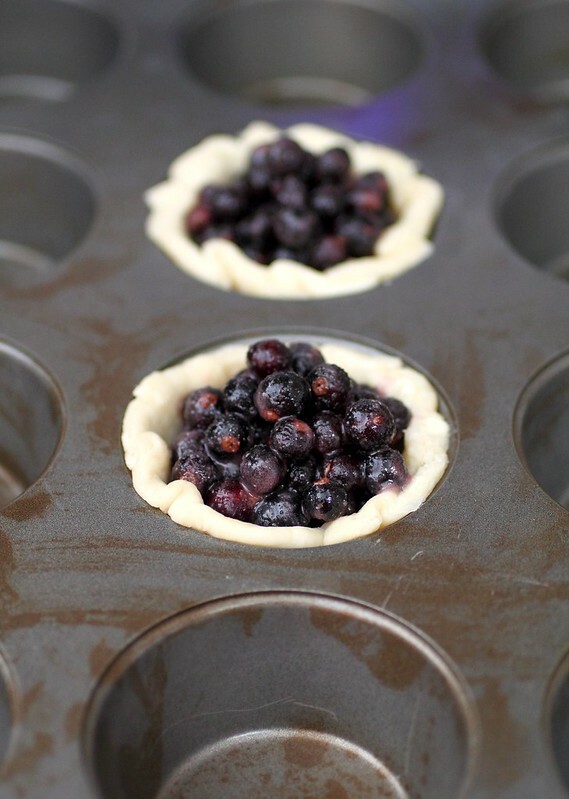 Roll out the second pastry disk and use to cover the pie or create a lattice work. tuck in the edges and brush with the mixture of egg yolk and cream. Sprinkle pastry with granulated sugar for a beautiful crust. 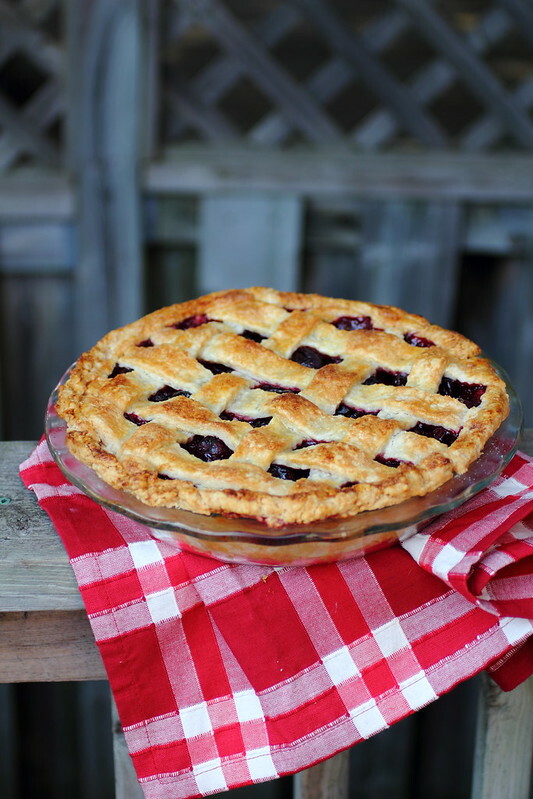 Place the pie plate on a aluminum foil lined baking sheet and bake ..
Bake Cherry pie at 400 degree F preheated oven for 20 minutes, reduce heat to 350 and continue for another 30-40 minutes until crust is golden and filling is bubbling. 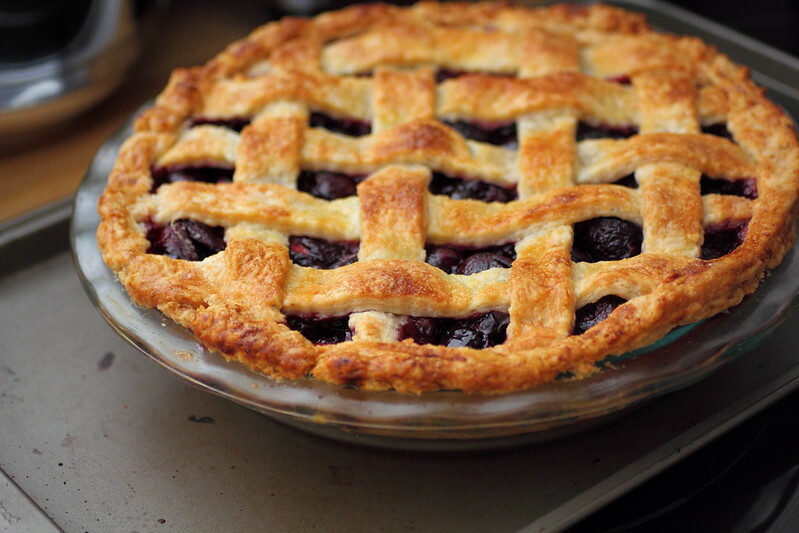 Allow pie to cool for 2 1/2 - 3 hours before enjoying. Be careful if you're transporting it somewhere in a car, for instance, as the filling can spill out and over, it happened to me! 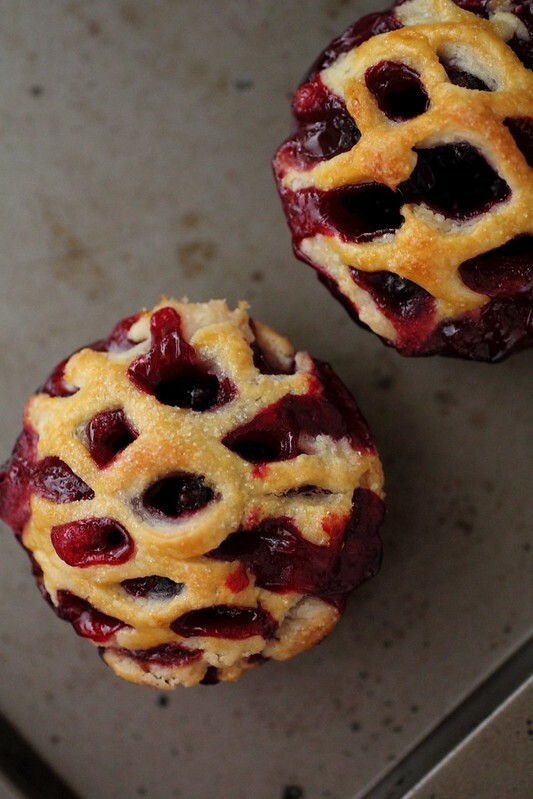 Instructions: Assemble same way as cherry pie and bake in a 400 Degree F preheated oven for 45-50 minutes until pastry is golden and filling is bubbling. Cool 2-3 hours before cutting into it. Roll out pie dough to fit pie dish. Gently press dough down into dish so that it lines the bottom and sides of the dish. (Be careful not to pull or stretch the dough). Then, use a knife or pair of kitchen scissors to trim dough to within 1/2-inch of the edge of the dish. Fold edges of dough underneath itself, creating a thicker, 1/4-inch border that rests on the lip of the dish. Then, crimp edges. Heat oven to 425 degrees F (220 C). Place a baking sheet on a middle oven rack. Pierce bottom of the crust with a fork (this prevent air pockets or bubbles from forming while baking). Line the crust with two sheets of aluminum foil. (Be sure to push foil against the edges of the crust). Then, fill foil with dried rice, dried beans or pie weights. 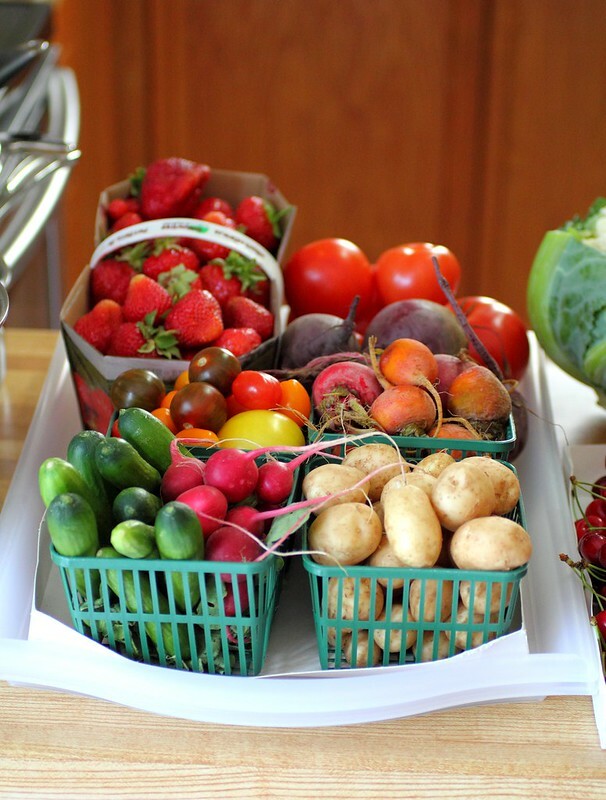 Refrigerate 30 minutes or freeze for 10 minutes, or until firm to the touch. Cool crust completely before filling. Add 2 cups of strawberries to a small saucepan. Mash strawberries until chunky. Add sugar, corn starch, vanilla extract, lemon juice and salt. Bring to a simmer over medium heat and cook, stirring occasionally, until sugar dissolves and glaze has thickened; 3 to 5 minutes. Cool completely. Combine remaining 3 cups of strawberries (keep them whole or slice them into quarters) with cooled strawberry glaze. Stir until strawberries are well coated. 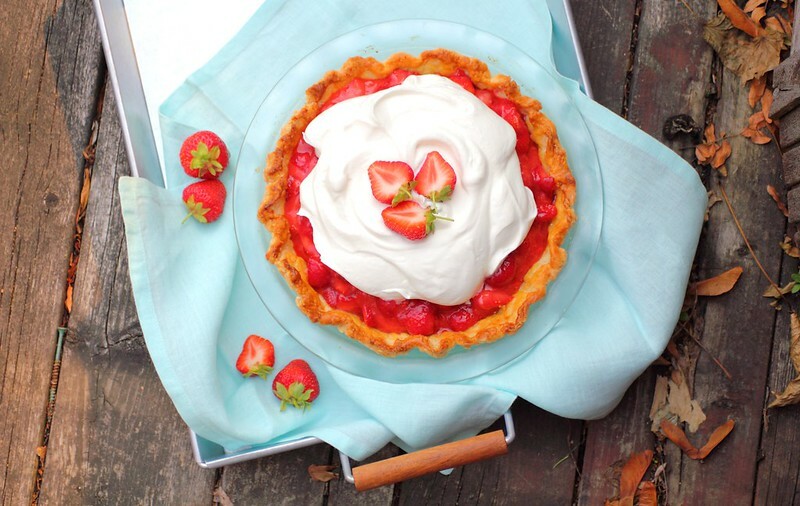 Spoon strawberry filling into cooled pie crust. 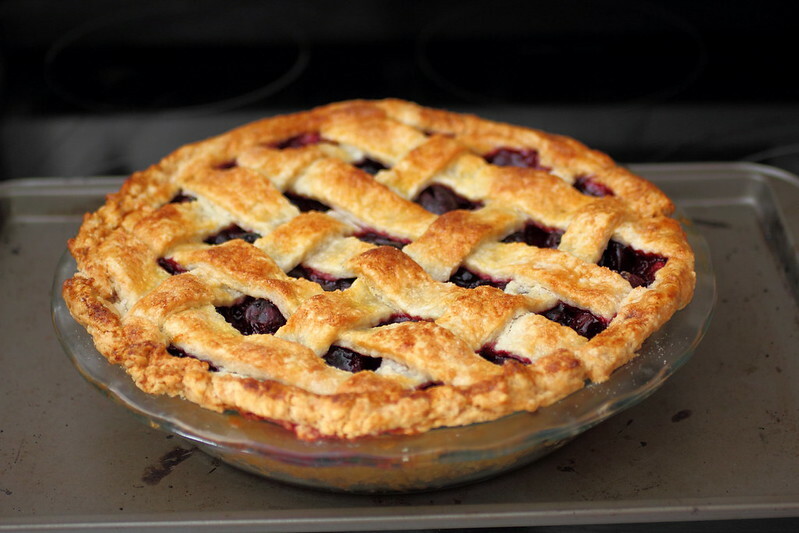 Refrigerate pie at least 2 hours before cutting to allow filling to set. Top with whipped cream and decorate! Enjoy! 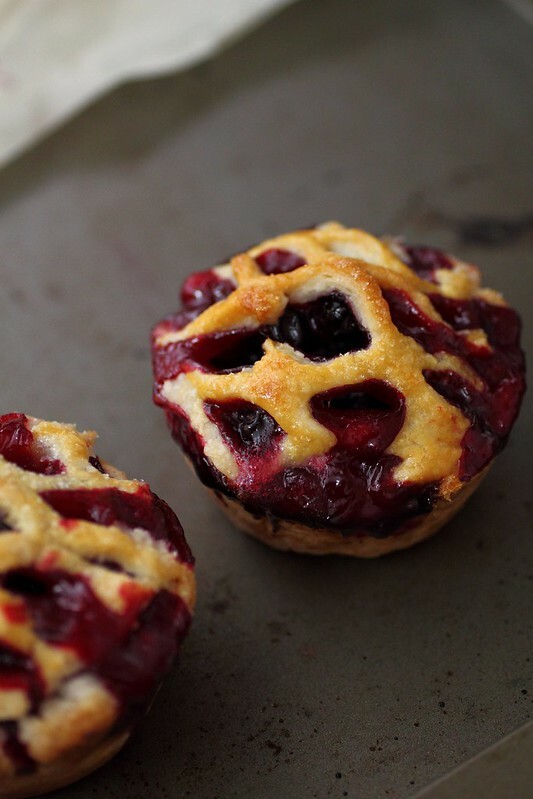 I make these whenever I have leftover bits of dough and not enough fruit for a big pie or tart ... my mini cherry pies from a couple of summers ago are still a big hit, and attract the most readers to my blog, my husband just loves these little pies and requests them every summer. This year I used our black currant harvest from the bush we have in our backyard which yielded quite a nice amount! I've never made black currant pie before so I used the same guidelines as the blueberry pie and kept it simple, it's truly delicious! Since these pies are smaller I preheated the oven to 400 and then as soon as I put 'em in set the oven to 350 and let them back until browned and bubbling. Don't forget to brush with egg yolk and sprinkle sugar, just like the other pie recipes above. I've always been fascinated by these sour cherries because I would see them up in the trees while we picnicked in the Niagara region of Ontario and I would wonder if they were actually edible. 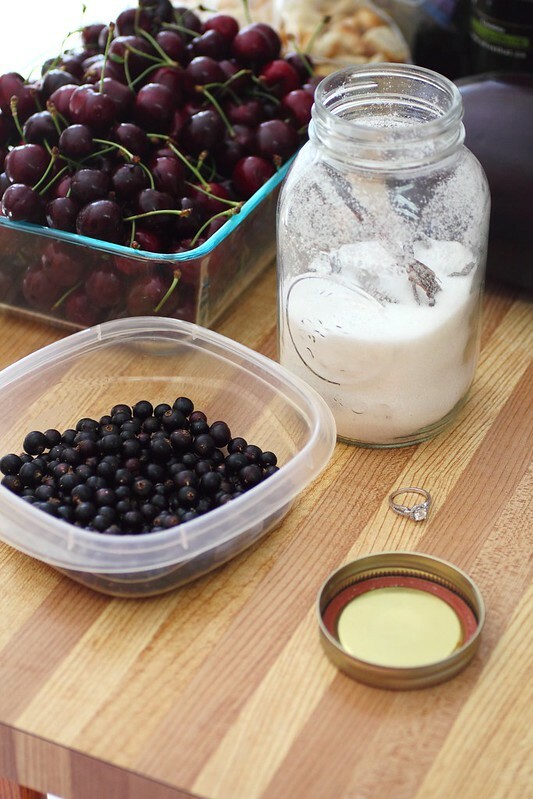 A couple of weeks ago when my family moved to a house we found out that there was a cherry tree in the backyard, and we noticed people picking the same type of cherries off the same trees in the neighbourhood so when I had a taste for the first time I knew they would make for some delicious baking! 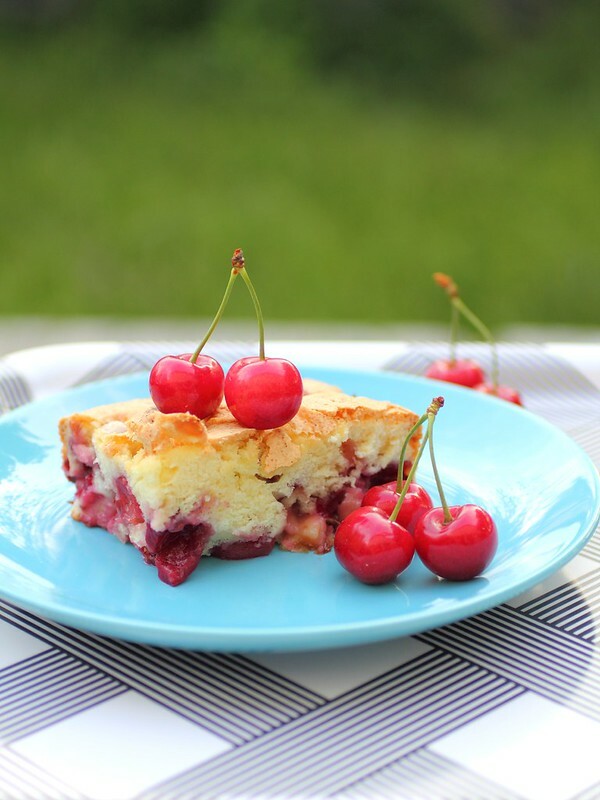 The recipe I'm posting today came from a friend on Instagram, I've been eyeing her homestyle Russian recipes for a while and bookmarked this cake for quick summer time baking and sure enough these cherries were PERFECT for the recipe! I'm so in love with this cake that I know I'll be making it again and again with different fruits and trying that warm cinnamon version that she wrote about on her blog Imagelicious, please stop in and check it out! I won't put the recipe here as you can head over and check out hers, but I'm telling you, this is such an easy recipe ... it's faster to whip up than an omelet!